*SNORE ALERT* I shall be talking about my Gap Year. However, I like to think my Gap Year wasn’t an ordinary travelling experience. Bored at school I threw a dart at a map and said to myself I would go wherever it landed. Point of destination? Tonga. Now I knew very little about Tonga other than it was in the middle of the South Pacific and so was bound to have a good beach or two. So, off I went for three months. During my stay I experienced; unimaginable heat, trekking on a remote island whilst a cyclone hit resulting in nearly drowning and being stranded for a week, a member of the Royal family dying which involved 2 weeks of mourning and being invited to kiss the body which was situated in a fridge, and finally, a Tongan feast where they cater 1 pig per person. Their cuisine was interesting, to say the least. Spam was everywhere; fried, baked, mashed, Spam was the go to answer. The saving grace were the bakeries which were surprisingly good. 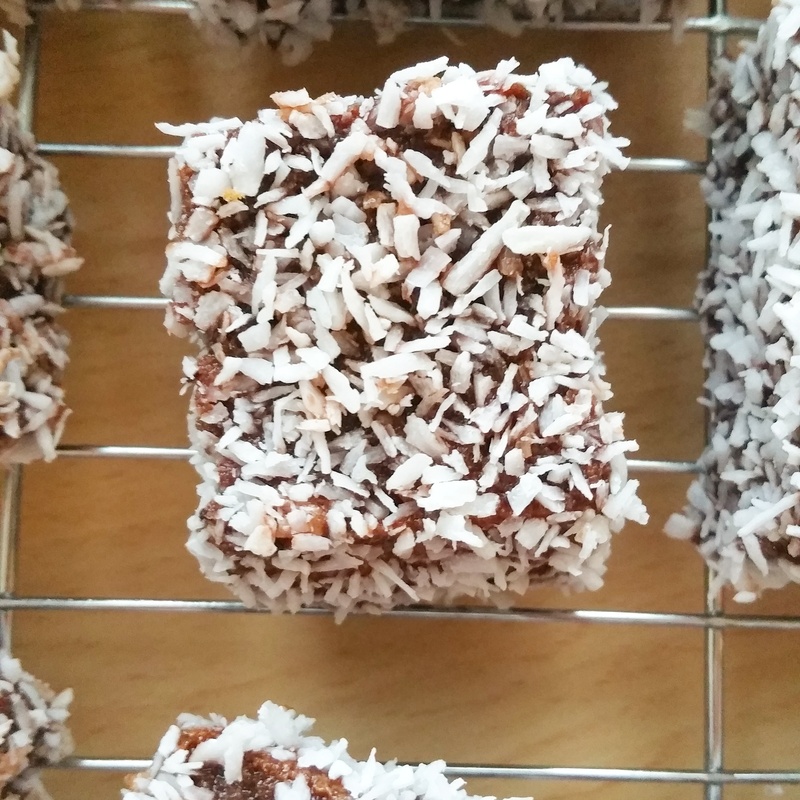 One thing which firmly stuck in my mind were Lamingtons, a combination of delicious sponge, dunked in chocolate and then sprinkled in coconut. Despite them being an classic Australian bake, they make me reminisce of my hazy, slightly bonkers, Tongan days. Preheat the oven to 350˚F/180˚C/gas 4. Grease and flour a 20cm x 30cm pan, lining the base of the pan with parchment paper. Beat the eggs, sugar and vanilla in a large bowl with an hand mixer (medium-high speed) until pale and thick (around 3 minutes). Sift the flour and baking powder over the egg and sugar mixture and use a rubber spatula to gently combine the dry ingredients. Add the melted butter, about ⅓at a time, gently mixing with a rubber spatula until completely combined, then pour the mixture into the prepared pan. Bake for 25 minutes, or until a skewer inserted into the middle of the cake comes out clean. The cake should spring back when lightly touched in the centre. Turn cake onto a wire rack to cool. Cut cake into even, bit-sized pieces about 4-5cm. You will probably end up discarding the edge pieces, as they won’t be completely square. At this stage you can refrigerate the cake for a few hours or leave the cake overnight in an airtight container, because a slightly less fresh cake will be easier to dip in the chocolate icing. When you are ready to dip the cakes, set up an area large enough to accommodate bowls for the cake pieces, the chocolate icing, the coconut and also a large tray topped with parchment paper and a cooling rack. You will need to work quickly to dip the cakes so having everything organised in advance will help. 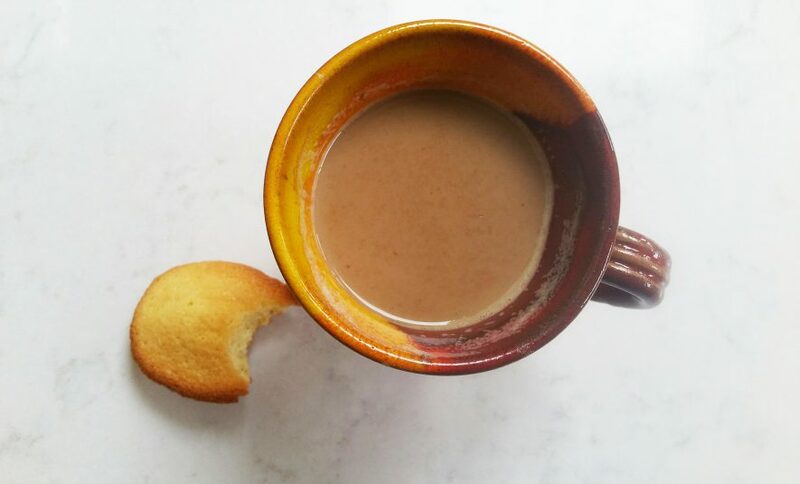 Sift the icing sugar and the cocoa powder into two different bowls. In a large saucepan, melt the butter, then mix in the milk. Next, using a whisk to stir, start to add the cocoa powder. Once the cocoa powder is completely dissolved, add the icing sugar about a cup at a time, whisking constantly to prevent lumps. When all the icing sugar is combined, pour the chocolate mix into two separate bowls – that way when one mix gets full of crumbs you can switch to the next one.Working quickly, using a fork, dip the cake cubes into the chocolate mix and roll them around with the tines of the fork to completely coat. 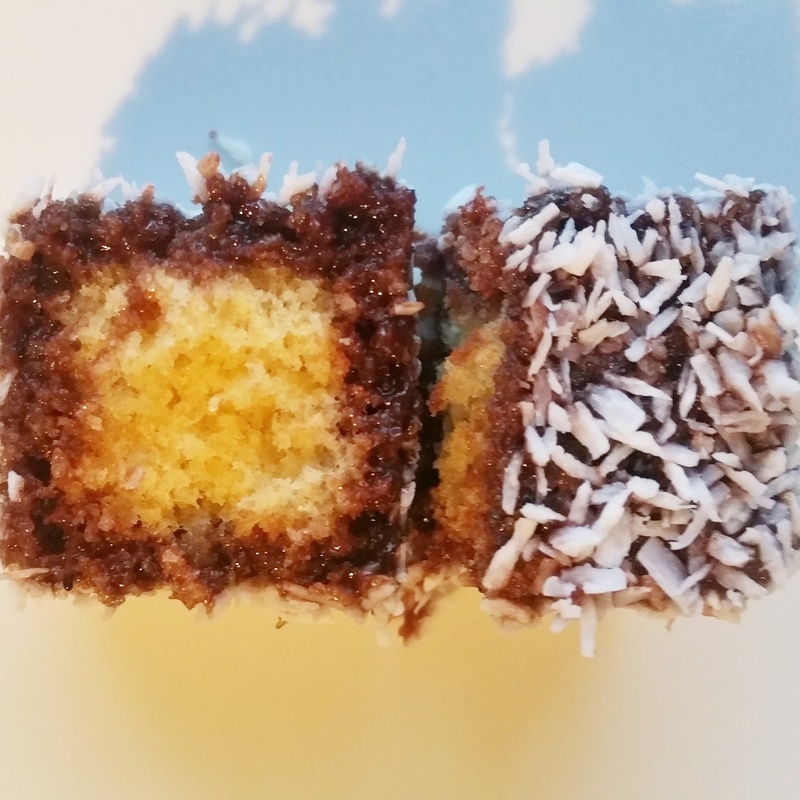 Drain any excess mixture off the cakes then drop them in the coconut and roll them around lightly to coat evenly with coconut. Set the cake cubes on the cooling rack placed over parchment paper to drain. You can refrigerate the cakes to help set the icing, then bring them to room temperature before serving. Directions for use: If you wanted to make large Lamingtons cut them in half and spread with raspberry jam before dunking them in chocolate.